What would you make with Amanda Murphy's Free Motion Fantasy fabrics? We have five designers this week who will be showing you how they used these fun, colorful prints. Today we have projects from two designers-- Jayne and Laura--get ready to be inspired! "Free Motion Fantasy had me at ‘free motion’, something that I’d love to master one day! The fabric evokes all the best of FMQ from pebbles to swirls. The floral and geometric designs along with the bright colors were the icing on the cake for me!" 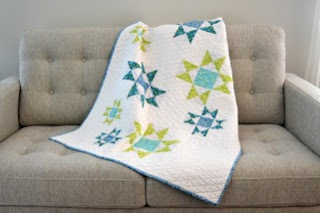 Jayne used the teals and greens from Amanda's collection to make varying sizes of Ohio Star blocks floating on the Flying Geese White print background. Beautiful! 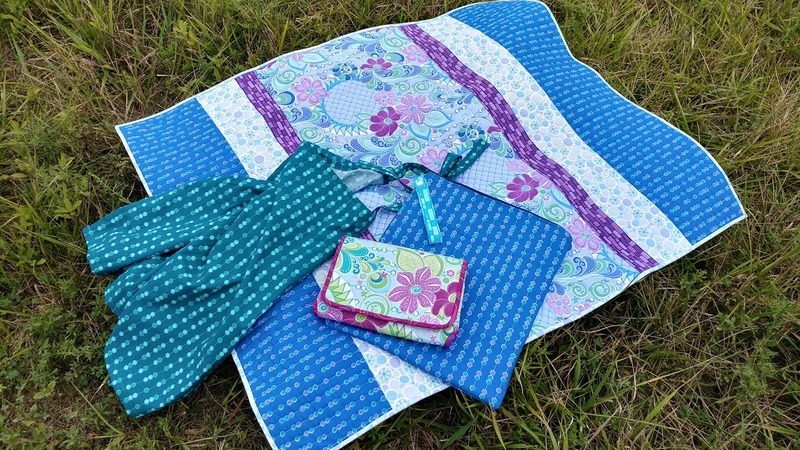 Head to Jayne's blog to read more about her quilt and find out how you can win a FQ bundle of Free Motion Fantasy prints. "I'm 36 weeks pregnant, so I had baby on the brain when I got the Free Motion Fantasy fabrics! I really wanted to try making a quilted diaper changing pad, so that's what got my creative juices flowing. Then I added a wet bag, nursing cover, and a quilt, of course! I've always loved Amanda Murphy's fabrics. I think it's pure genius to create fabric with free motion quilting motifs!" Laura used blues, purples, and teals from Amanda's collection and used her new long-arm to finish a few of these projects! What new mom wouldn't prefer these handmade beauties to the options available in stores?!? Head to Laura's blog to read more about her projects and find out how you can win a FQ bundle of Free Motion Fantasy prints.